German astronomer Johannes Kepler (1571–1630) was very interested in the mathematical and mystical relationships between objects in the solar system and geometric forms such as spheres and cubes. In 1596, before working as an astronomer, Kepler published Mysterium Cosmographicum, which explored some of these ideas. Later, working with Danish astronomer Tycho Brahe and his data, Kepler helped establish the basic rules describing the motions of objects moving around the Sun. 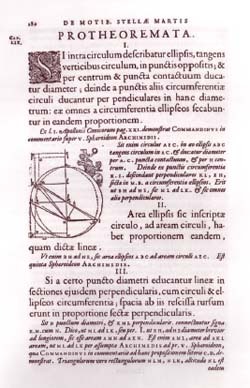 A diagram by Johannes Kepler from his 1609 work Astronomia nova, depicting Mars orbiting the sun, to illustrate two of his laws of planetary motion.